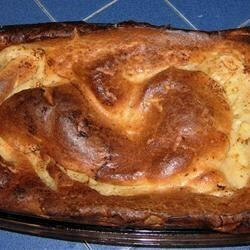 "Flour, salt, milk and eggs, along with roast beef pan drippings, make this classic Yorkshire pudding to serve with roast beef." To Make Pudding Batter: In a large bowl combine the flour, salt, milk and eggs. Mix all together with a hand beater just until smooth. Prepare Yorkshire pudding 30 minutes before roast is done. Remove roast from oven and spoon drippings into a 9x9 inch pan, to measure 1/2 cup. Increase oven temperature to 425 degrees F (220 degrees C). Return roast to oven. Pour pudding batter into pan with drippings and bake in preheated oven for 10 minutes. Remove roast from oven; continue baking pudding for another 25 to 30 minutes. Let cool, cut into squares and serve with roast. This was not the best pudding I've ever tried, I'm not sure why, it just didn't quite taste like the originals. This is the same recipe I've used for years. just a couple of tips -- spray the muffin tins with Pam, and DON'T open the oven. Great recipe. However, I prefer the muffin tin.